Did you know that guitar manufacturers often use lower quality pickups in order to reduce costs? Your guitar may be even more powerful than you think. With the right set of pickups you can unleash your guitar’s full potential, and you can rest easy knowing that your guitar sounds better than most. Steer clear from the cheap knockoffs that are so widely available today – if you want the best sound, you’re going to need the real thing. So pull up a seat, let’s take a look at some of the best guitar pickups available today. There are two main types of guitar pickups – single coil and humbuckers. Single coil pickups are often characterized by a brighter top end, and they are commonly found in the popular Fender Stratocaster (as such, single coil pickups are often referred to as ‘strat pickups). Humbuckers on the other hand are often characterized by a thicker, warmer sound. As such, they are more commonly found in blues and rock, and come stock on many Gibson guitars. Some humbuckers have the ability to also be run as single coil pickups, as long as they are properly wired. This allows for more versatility. All of the pickups reviewed here are humbuckers. The main point is that it’s easier to get a design that will fit your guitar without modification – we will discuss this in more detail later. Consider the sound that you are hoping to achieve. Some products are known to be exceptionally clean, and will preserve the purity of your sound. Conversely, many pickups are coveted particularly because they have a high output gain with rich harmonics, resulting in a thicker sound with lots of sustain well suited for distortion. Along the lines of drive, some products are classified as active (i.e. they have a higher output gain but require battery power for them to work properly) while others are classified as passive (i.e. no battery required, but they will have difficulty achieving the output of active designs). If your axe already has active pickups, you’ll probably also want to choose and active set for your replacement set as a passive set will likely seem lacking in power. 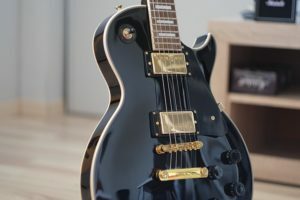 However, if your axe has passive pickups and you want to install something active, you’ll have to consider how you will supply the battery power – which brings us to the final decision point of installation. The final point to keep in mind is the ease of installation. Guitar pickups will need to be properly wired and fitted into place. While soldering is an achievable skill, it is likely not something you will master on your first try. You should be well practiced before trying to perform installations, and if there is any doubt you should consult a professional guitar tech. Some products offer solderless install, which can help make the process much easier. You will also want to make sure that the pickups will physically fit your guitar. 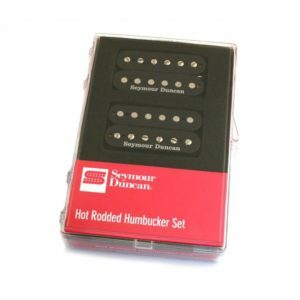 If you are replacing humbuckers this is usually easy, but if you are replacing single coil pickups you will probably want to choose something like the Seymour Duncan Hot Rails (View on Amazon) that are the right shape. Many people will modify their axes to accept other types of pickups, but this is not to be taken lightly. If you have any doubt in your decision at all, you can always consult a guitar tech. 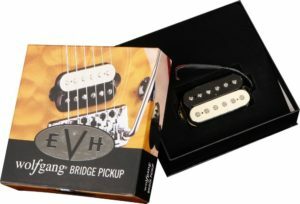 This set of pickups comprises of SH-JB for the bridge and SH-2n Jazz Model the neck. This gives an incredibly versatile pickup for most of the music genres. The JB Model has hot coils and Alnico five-bar magnet thus its suitability for any bridge position for a humbucker equipped guitar. It delivers versatility in the name of upper midrange attack, tight, articulate low and highs. The JB is a great bridge for blues, country music, metal, and metalcore. The Jazz Model neck uses Alnico five bar and a first coil which gives a clear, glassy treble balancing with its full but low, tight end. It works for any style of music. 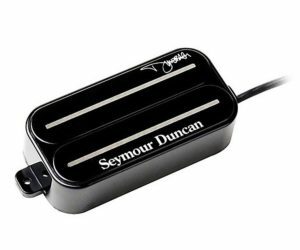 This authentic combination of the pickup gives a greater clarity and definition, as well as producing fantastic sounds. The standard EMG Het Set has an impressive sound quality for both neck and bridge. It would make an excellent option in rectifying any axe producing a thin sound. Primarily, these PUPs can boost an amplifier without the need for an overdrive pedal. They can allow the user to raise them to a point where they do not touch the strings and still sound defined. They also assist in setting the gain at the most appropriate point. These bad boys do not drown the higher ranges and sound unique, unlike other active designs. They are harmonically rich as they make every tone stand-out even if the gain seems overwhelmed, and they also manage lower tunings very well. They are among the best guitar pickups for metal. The Het Set is also incredibly fast tracking. However, the paint coating may not be very high quality. It peels or scratches off easily. Installation of these PUPs requires only moderate skills, as it is relatively easy. 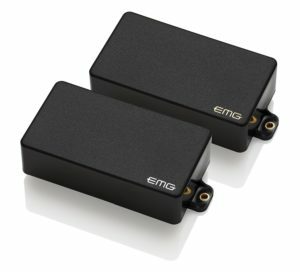 The EMG Active Pickup Set is designed for high-output, preferably for lead guitarists. 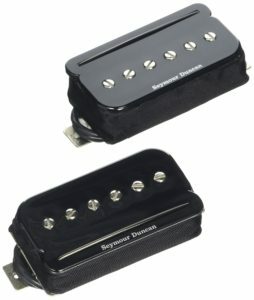 The pickup is amplified with a master volume and is the best pickup for metal. Essentially, this is EMG-81. It gives a sharp attack when playing power rock giving it exceptional qualities for metal core. Interestingly, the pickup is quiet to avoid noise when plain at a high gain. The wide aperture steel holes and ceramic magnets give a quick attack and at the same time maintaining a beautiful and fat tone. The pickup is capable of blending out overdriven sounds with the master volume to cut through thick band mixes. It can also produce smooth and clean tones ideal for ballads. Installation is easy and quick as it is solderless and includes quick-connect cables. Even though the EMG-85 pickup has more output than the 81, it has a different frequency and string interface. It is an excellent choice where there is a need for rhythm pickup combination with EMG-81 as it works great as a rhythm and blues pickup. It also works best where there is a need for inherent distortion resulting from overdriving the front end of the amp. The combination gives the best pickup for metalcore. These PUPs have vintage-style coils that give them an excellent airy quality. They also have a pair of Alnico 5 bar magnets and vacuum wax potting to compensate for lighter strings and powerful amplifiers. The vacuum wax-potting ensures high-pitch noise does not characterize the performance. This gives a heavy old-school tonal feature. However, the top end is brighter while the sound feels compressed. Other components of the SH-1’59 have long legged nickel silver bottom plate and vintage single wire conductors. The braided shield, single wire conductors, is easy to install for those well versed with guitars. The 59s give the user some warmth and depth. Besides, the features provide for continuous tone and volume. The bridge is more trebly owing to the beautiful open winding Alnico magnets and a slightly under wound neck. These features make the 59s apt for jazz and blues genres. They are, however, not suitable for hard rock. They will still do an excellent job for classic and alternative rock. The SH-1 ’59 is essentially a handmade product with a traditional element and good quality control. 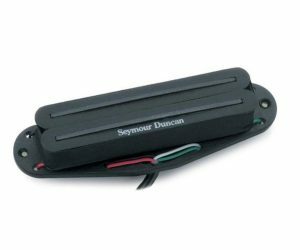 The Seymour Duncan SH-13 Dimebucker is a pickup designed for metal tone. It gives a crunchy pick attack, scooped mid, and the right amount of saturation. It has a powerful ceramic magnet and dual stainless steel blades. Besides, the pickup will give you a tight, low-end response. It has been designed to provide some additional gain, but exceeding that level breaks the sound. The metal used is light in order to provide high direct current resistance and resonant peak. As a result, an aggressive, high-output humbucker with lots of clarity and treble bite is generated. It gives a warm tone with a mix of distortion that combines with low and top ends ripping off your face! It is thus among the best pickups for metal core. It also rocks hard with tube and solid-state amps. The pickup comes with a schematic diagram to assist in installation and a custom mounting ring. 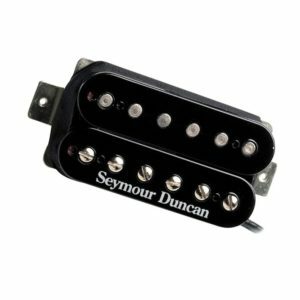 Like other Seymour Duncan products, the SH13 is handmade and usually available in black color. In the old days, players would need to have three different guitars to have access to a humbucker tone, a P90 tone, and a ‘strat tone. The P-Rails now bring a three-in-one set-up when used with an ON-OFF-ON mini switch. They are a drop-in replacement for a standard humbucker slot. It is possible to split each of the hybrid humbuckers with the intention to cut the Rail coil or give a super fat P90 for a Strat tone. The two coils provide a big sounding humbucker, which in turn packs a nice full punch. It is important to wire the neck version in such a way that it will be possible to use both P90s and both Rails at the same time to give a hum-cancelling tone. The rails use a pair of Alnico 5 bar magnets each. They have a four-conductor lead wire with vacuum wax pots to prevent high-pitched operation. 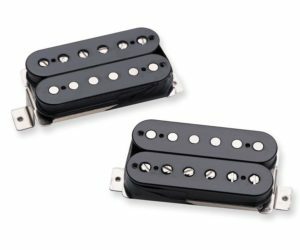 One advantage of P-Rails is that they can be used in any guitar set up for a humbucker or single coil sounds.In essence, the P90 mode is very versatile and a little bit more punch than a Strat single coil. It is thus perfect for going back and forth from rhythm to lead. The pickups are suitable for the production of a classical sound. They give three correct classic pickup sounds on one guitar. They are however not suitable for high output or super heavy sounds. This could be one of the best sounding pickups you’ve ever tried. It is an impressive, expressive, bright, and articulate product. It comes pre-soldered so you won’t spend a lot of time during installation. It does however work in humbucker mode only. The PUP gives a full sound a without affecting the quality of highs, mids, and round deep lows. They offer an excellent, clean sound when rolling back the volume. The notes can be heard with a lot of sustain for leads and plenty of chunk for rhythm, demonstrating great articulation in any case. This PUP is versatile as it can be used for practicing, playing in concerts, and recording. Specifically, it is perfect for rock, pop, jazz, blues, and country. It would make an excellent choice for those playing modern rock and country music. The EVH Wolfgang Bridge Pickup is a bit pricey but it still worth it. It would be counted among the top options offering quality tone, distortion, and durability. This is a single rail sized humbucker designed for high output, midrange harmonics, and aggressive crunch. The pickup gives a sustained, fat and full sound for heavier music. It makes one of the best pickups for metal core. 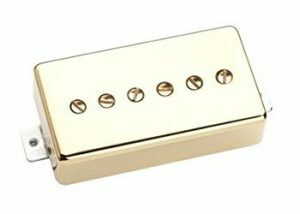 It can be ranked among the best pickups for metal core, as it is capable of changing a Strat into a great instrument. It has a ceramic magnet, four-conductor lead wire and potted wax for squeal reduction. It responds to even subtle finger movements, and the conductor cable facilitates flexible switching options. The pickups may have some difficulty in installation to those with little skills in the wiring. It gives a range of installation options. It may also require soldering. Nevertheless, don’t worry there are directions to help. Moreover, there are numerous online videos with helpful instructions. This pickup sounds great on any guitar. It is one of the greatest options in the market. It is however perfect for jazz and can even allow a user play some heavy metal. It has a deep low end and a good treble response. The mids are slightly less than those found on a real ’59 humbucker. The coil split is good and provides quite a different tone from the full humbucker. It rides on the reputation of Seymour Duncan pickups, which are known to have beautiful tones. The distorted sounds are full and clear with a smooth sustain. It is vacuum wax potted to ensure a high-pitch free performance. It is often used together with hotter bridge pickups such as SH-4JB for additional versatility. It is can, however, be found in both neck and bridge models. This pickup is a true single-coil P90 used in humbucker guitars. It is one of the best pickups for a metal cored instrument. It has an original grit and growls only found in vintage P90 Soap-bar in a bridge position. It has two Alnico magnets for a sustained and compressed attack. The metal cover provides additional shielding and reduces noise. The chords have bright, ringing harmonic overtones while the solos have a classic P90 cut and edge. Other features are nickel silver bottom plate, single-conductor braided hookup wire and vacuum potting to avoid high-pitch. The neck model and reverse wind reverse polarity provide for noiseless operation. The pickup essentially gives a clear sound distributed across the guitar strings. 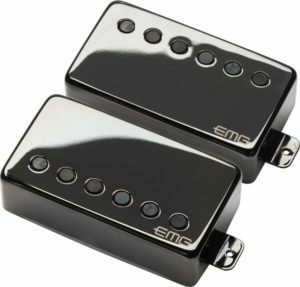 The tone remains the key strength of Seymour Duncan SPH90 Phat Cat P90 Electric Guitar Pickup.